We stayed in the anchorage at Punta Salinas for over a week. The shelter is good and the nearby marina is run by friendly staff, with a nice bar and all the usual facilities for a reasonable charge. The end of February seems to be a quiet time of year here and even at the weekends the place wasn't really busy. It is essential to have a car to get about and explore the eastern end of the island. Hiring one was easy - a local outfit keep cars at the marina and were quick to respond. 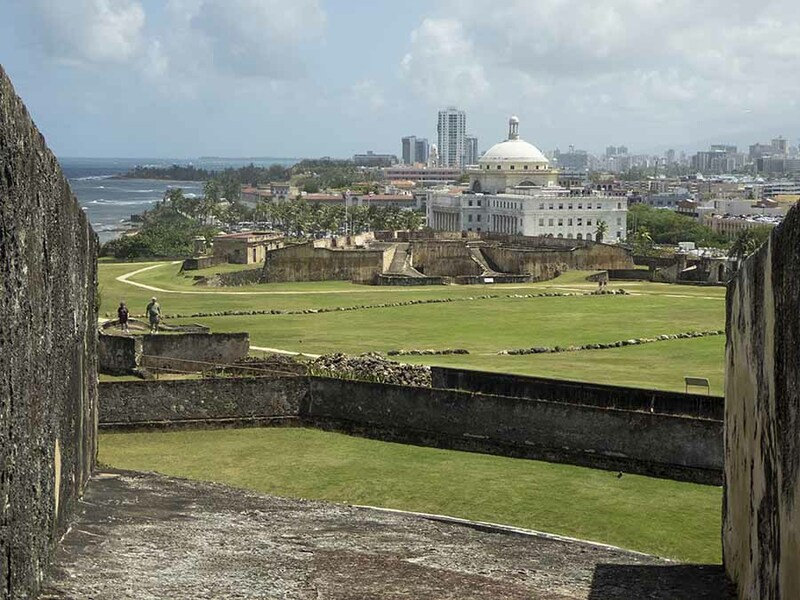 We drove north for a day trip to San Juan, the capital of Puerto Rico. The drive through the central mountains to the other side of the island is on a good motorway with some great views of the countryside. 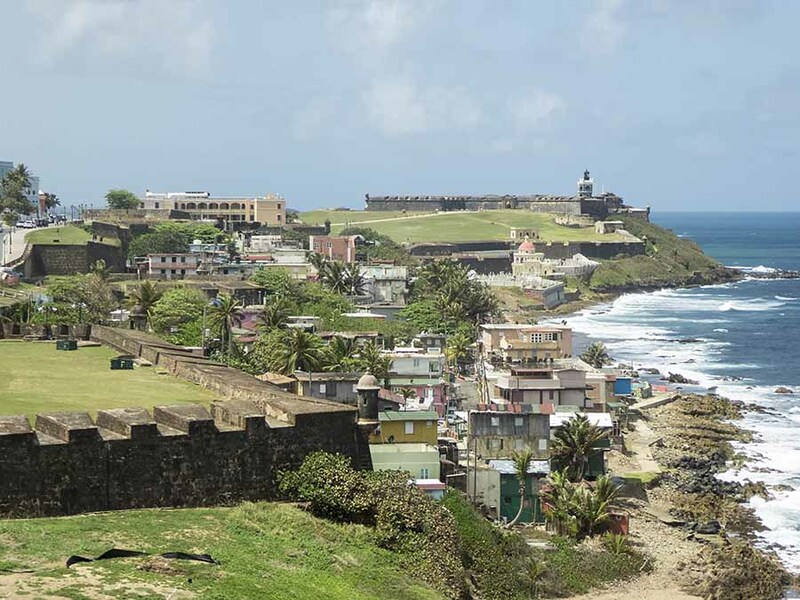 Old San Juan is a very pleasant place to wander around, with narrow cobbled streets, colourful and grand buildings, old walls and fortifications dating back to the 16th century. Throughout our stay in Puerto Rico we've been enjoying the climate. Generally it has been cooler and fresher than we remember from elsewhere in the Caribbean, apart from when we've been at altitude. 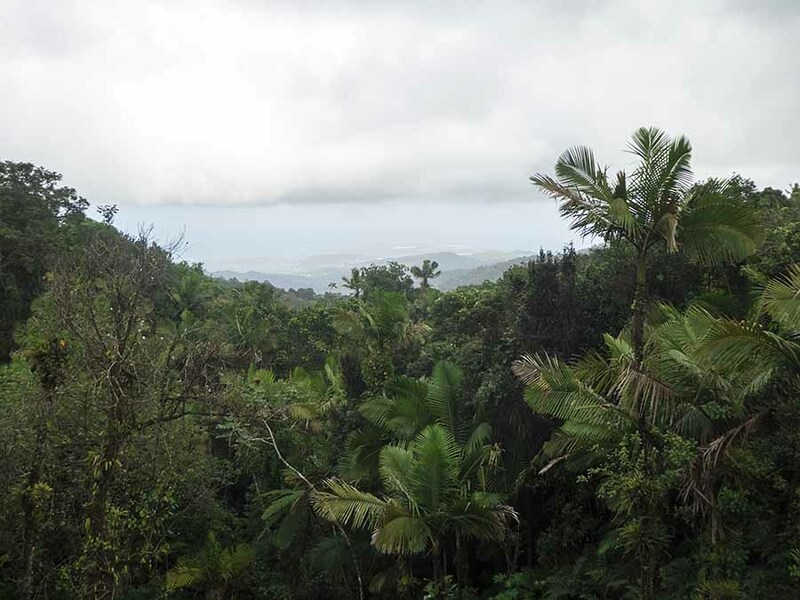 We were expecting even cooler weather when we visited "El Yunque", the only rainforest in the US - and a veritable goldmine when it comes to biodiversity. Like the national parks we visited in the states, the trail system is well managed so, despite not having been hiking for a while, we took the "hard" trail through the cloud forest to the top. It wasn't actually that cold, but there were frequent showers so we did notice a drop in temperature. After an enjoyable 2 hour ascent through the forest, what did we find at the top? You guessed: cloud as far as the eye could see (20 or 30 feet). On returning to Lynn Rival we were hailed by another yacht which turned out to be Ocean Rainbow. We'd last seen Claire and James in Trinidad, over a year ago, but had communicated with them recently because they were in Guatamala and - at the time - we had been planning to go there. Since leaving Guatamala they have been making their way back east, against the wind so having to work very hard. They were surprised to find us in PR. We had lots to catch up on, explaining our change of plans, about Mystic, and hearing about all their experiences in Guatamala, Belize and Cuba. 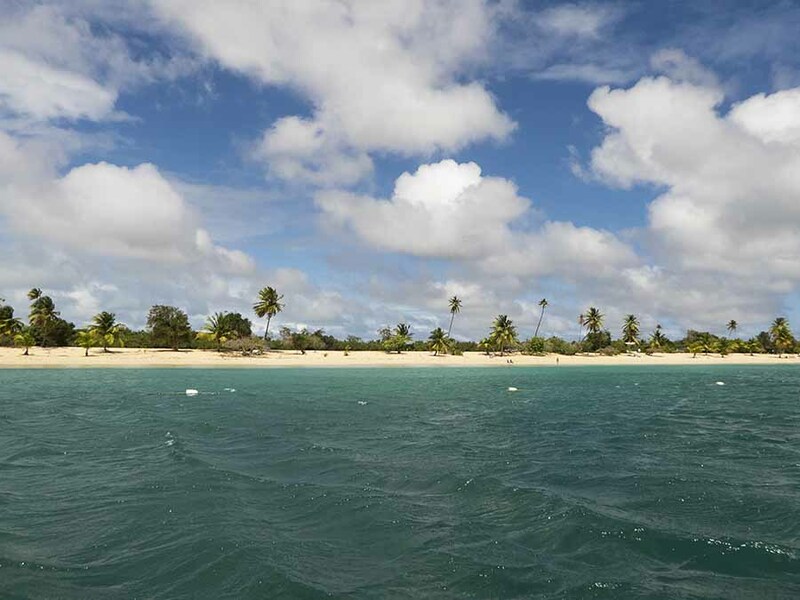 The weather forecast wasn't great for continuing east with the trade winds generally strong during the day. 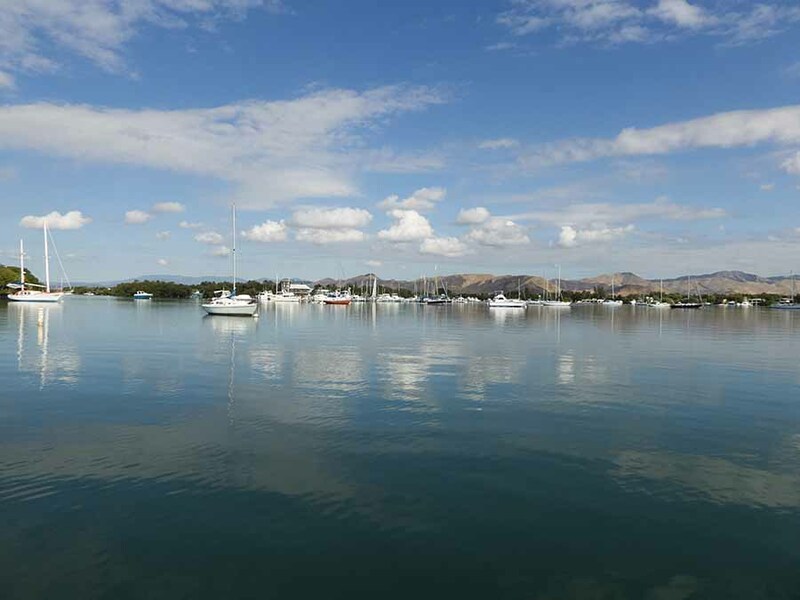 We left early on Friday morning, in company with Ocean Rainbow, and motored inshore a few miles to the Bahia de Jobos where we anchored for the day sheltered by the off-lying reefs. It's a lovely place, with all sorts of wildlife, but the all-round view is marred by a large power station onshore at the village of Aguirre. In the evening we weighed anchor again and tacked along the coast, sometimes motoring in the nighttime lulls and sometimes struggling when squally weather passed over, with wind shifts and rain storms to dampen our spirits. At dawn we were ahead of Ocean Rainbow and tacked inshore to sail up the east coast of PR, then tack across the channel to the island of Vieques. A poor decision - Ocean Rainbow went offshore, which turned out to be much better. We finally reached our destination - a bay on the south side of Vieques near the village of Esperanza - in the mid-afternoon, finding them already at anchor and settled in. 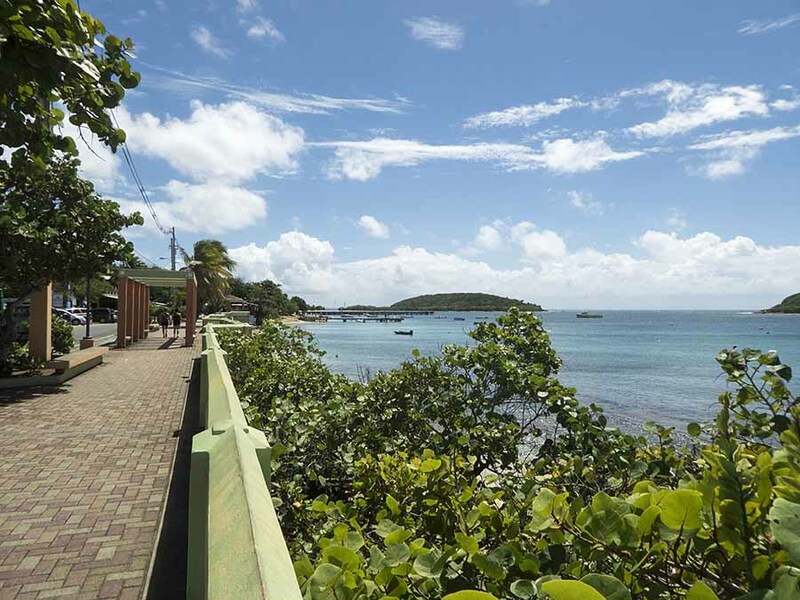 Vieques and the smaller island of Culebra to the north are sometimes called the Spanish Virgin Islands and are now a popular tourist destination. Until recently Vieques was used by the US military for bombing practice so it is relatively undeveloped and has some excellent anchorages and beaches on the south coast - never mind a few remaining unexploded bombs! We are in a large anchorage called Sun Bay with just a few other yachts. The village of Esperanza with bars and restaurants is not far away. At the moment the weather is stormy so we're content to stay on board and wait for the winds to settle down before heading east again. The water is very clear here and we noticed quite a bit of weed growth on the hull - despite our efforts in Puerto Real - so out came the hookah again for another scraping session. This work will be worthwhile as our next passage will be a 250 mile slog to windward. Beautiful Sun Bay, well sheltered and not at all rolly, until the prevailing easterly swell came in!